Find out how the market is doing. The easier you make it to access all of this information, the better. If they can easily access one of these four, you’ve satisfied their taste for information and you’ve earned their attention. From there, what you do to keep that attention is either going to lead to a sale or it’s not. But really, it’s all about how easy you make it for the reader to establish a connection with you after they’ve landing on your website. 1. Make it easy to find what I’m looking for. If I’m looking to search for homes, it should be blatantly obvious where I should go or click to get to that home search page. One of the reasons I like Jay Thompson’s Real Estate Blog is that the Call To Action is obvious… If I want to search for homes, I know exactly where to click to do just that. When you’re designing or re-designing every aspect of your real estate blog, ask yourself, am I making easy for consumers to find what they’re looking for? 2. Make it easy to subscribe. Dale Chumbley knows his community better than anyone. It shows. He writes about local business, places to eat, activities, and more. If I want to subscribe to read updates from him, there’s a big subscription form that reads “Get Daily Updates.” I don’t have to work hard to find it, it’s right there, front and center. Make it easy for people to subscribe and get updates. If they like your content, they’ll want an easy way to subscribe and read the stuff you’re putting out there. 3. Get rid of that partial RSS feed. I understand the incentive here. Offer readers a tiny snippet of content. Just enough to pique their interest and get them to click over to your site. In theory, this sounds great but in practice, you’re potentially turning off a lot of subscribers who’d rather read the full RSS feed – I’m in this group. I prefer (and I expect) to be able to subscribe to a full RSS feed so that I can read your content from my feedreader or read it on the go. That’s why I subscribed to it that way in the first place. Google loves good content, people share great content. So really, the question here is, are you making it easy for people to share your work? There’s plugins that will help you do this like “Simple Social Bar.” This plugin will allow you to select which social networks/sharing options you want to display. Then, you can either display a bar horizontally or vertically on your posts. At a minimum I recommend displaying the most common social networks: Twitter, Facebook, (now) Google+. This one goes without saying… If the purpose of your Real Estate Blog is to generate new business contacts, then you should be making it easy to contact you. Every single page on your website should have some type of “contact” Call To Action. Your listing pages should have a contact form. Your name, phone number and email should be displaying on every page of your website. 6. Take it easy on the hard sell. 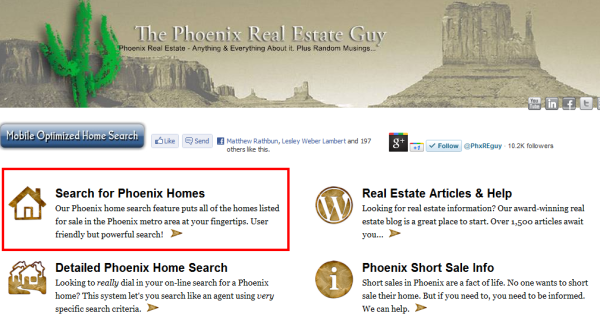 I know you’re selling real estate and the purpose of your website is generate motivated leads. However, there is such a thing as too much. What I mean is, we can tell when you’re trying to hard. Focus instead on establishing yourself as the expert on everything local (not just real estate). That’ll make you the go to resource. And when it’s time to buy real estate, guess who’s going to come to mind? What would you add? What other design tweaks would you recommend to make your real estate blog easier to read and engage with?